A short biography of First International member, brilliant agitator and organiser of the Marseilles working class, André Bastelica. Born at Bastia in Corsica on 28th November 1845, Bastelica was from an early age, extremely curious. He was an autodidact par excellence, like so many other workers found in the revolutionary movement. An anarchist even before the term had been properly applied, he started his working life as a shop assistant and then as a typesetter. Richard was to later comment on Bastelica that he “needed to live, to act, to produce… and to defend, in the light, the idea that was incarnated in him”. Bastelica was no “follower” of Russian anarchist Mikhail Bakunin, there was no master-disciple relationship. The two men acted as comrades in arms and were equals. Certainly Bastelica built a strong base in Marseilles for the anti-authoritarian socialism as conceived by Bakunin. Bastelica, along with Alerini, also journeyed to Spain in 1868 on behalf of the Bakuninist Alliance to strengthen contacts among the Spanish working class; this was prior to the visit by Fanelli, another associate of Bakunin, which was to be the key event in the firm foundation of revolutionary politics in Spain. A gifted journalist, he wrote for many revolutionary papers, like L'Égalité of Geneva, L'Internationale of Brussels, La Marseillaise of Paris, L'Egalité and Le Peuple of Marseilles, and for a range of literary magazines. His style was vivacious and précis. He was also a brilliant orator, and his gifts at expressing the revolutionary idea was one of the main reasons for the growth of the International in southern France. Coupled with this was his flair and practical sense for organisation. Founded in July 1867, the Marseillais section of the International saw a dramatic growth the following year with the arrival of Bastelica. Founded on Proudhonist organisational principles, it counted 27 groups within a Marseillais federation, which was one of the best organised in France. Soon its membership rose to 4,500. Leaving his comrades Etienne Combes, Charles Alérini, Poletti, Pacini and Roger to carry on the work in Marseilles, Bastelica went on an extensive propaganda tour throughout southern France. In Aix, 600 were recruited to the International. He built active sections in La Ciotat, Saint Tropez, Cogolin, Callabrières, Gonfaron, La Garde-Freinet, Toulon, La Seyne, and Draguignan. Bastelica went as far as the Herault and the Basses-Alpes and agitated amongst the population of the countryside. He wrote to James Guillaume on 28 April 1870 that: “ The Marseilles section marches resolutely along the road of great progress… I have just returned from an excursion among the revolutionary populations of the Var. What enthusiasm the International has raised with the passage of its propagator! I have acquired this time the unassailable, incontestable proof that the peasants think, and that they are with us.. all this movement is breaking my strength but augmenting my courage”. A police report tells us that he had little success in organising workers in Montpelier, unlike Sete and Beziers. “In these localities le sieur Bastelica has been able to create, under the name of federative committees, real secret societies of coopers, which have powerfully contributed to support a great agitation among the population and whose action is most particularly felt in election periods”. The spread of the vine-growing industry and the vicious crushing of the 1851 insurrection against the coup of Napoleon III had made the Herault a hot-bed of radicalism which was to be exploited by Bastelica. Four days after the letter to Guillaume, Bastelica was to write about the Creusot strikes in a socialist newspaper Le Mirabeau and predict that the State, the Church, the aristocracy and the bourgeoisie, previously at loggerheads, would form an alliance to attempt to confound a coming revolution. Bastelica attended the Congress held in Lyons in March 1870, chaired by Varlin and at which Bakunin participated, confirmed the determination of the French federations to proceed with their revolutionary activities. The chief minister, Émile Ollivier, getting wind of this, telegraphed the prefects of police, commanding them to target the International and above all strike at its head. Varlin and Richard were arrested, but Bastelica managed to escape to Barcelona, where he had good relations with the Bakuninist internationalists there. He returned to Lyons to take part in the abortive Lyons Commune of September 1870, alongside Bakunin. 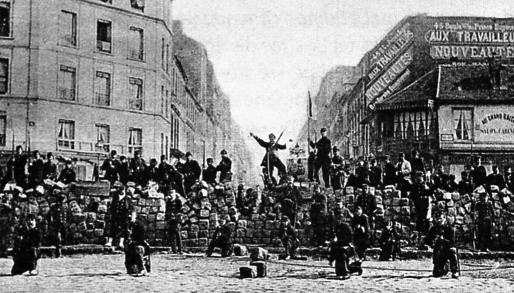 This was the first insurrection on French soil in which anarchists took part in any organised way. Later, with the defeat of the Lyons Commune, Bastelica was to shelter Bakunin at his Marseilles house for three weeks in October 1870. With the declaration of the Marseilles Commune, Bastelica was delegated to be sent to Paris to liaise with the Commune there. This was probably an unwise move, as Bastelica was probably one of the ablest revolutionaries in Marseilles and would have done more good there. Certainly the three delegates sent by Paris to Marseilles were hardly of Bastelica’s calibre. Nevertheless, Bastelica scrupulously directed the Service of Direct and Indirect Contributions of the Commune of Paris, handling millions of francs with great honesty. He managed to escape from Paris with the defeat of the Paris Commune. He was one of the delegates at the London Congress of the International in September 1871, where Karl Marx packed the conference with his supporters, passed resolutions destroying the autonomy of the sections and invested new powers in the General Council that violated the fundamental principles of the International. The defeat of the revolutionary Communes in Marseilles and Paris and the collapse of the revolutionary wave broke poor Bastelica’s heart. He died in poverty and sadness at the age of 39 in exile in Switzerland in 1884.